Lublin Voivodeship, or Lublin Province (in Polish, województwo lubelskie [vɔjɛˈvut͡stfɔ luˈbɛlskʲɛ]), is a voivodeship, or province, located in southeastern Poland. It was created on January 1, 1999, out of the former Lublin, Chełm, Zamość, Biała Podlaska and (partially) Tarnobrzeg and Siedlce Voivodeships, pursuant to Polish local government reforms adopted in 1998. The province is named after its largest city and regional capital, Lublin, and its territory is made of four historical lands: the western part of the voivodeship, with Lublin itself, belongs to Lesser Poland, the eastern part of Lublin Area belongs to Red Ruthenia, and the northeast belongs to Polesie and Podlasie. The Polish historical region that encompasses Lublin, and approximates Lublin Voivodeship as it was before the Partitions of Poland, is known as Lubelszczyzna. Provinces centred on Lublin have existed throughout much of Poland's history; for details see the section below on Previous Lublin Voivodeships. The region was, before World War II, one of the world's leading centres of Judaism. Before the middle of the 16th century, there were few Jews in the area, concentrated in Lublin, Kazimierz Dolny, and perhaps Chełm; but the founding of new private towns led to a large movement of Jews into the region to develop trade and services. Since these new towns competed with the existing towns for business, there followed a low-intensity, long-lasting feeling of resentment, with failed attempts to limit the Jewish immigration. The Jews tended to settle mostly in the cities and towns, with only individual families setting up businesses in the rural regions; this urban/rural division became another factor feeding resentment of the newly arrived economic competitors. By the middle of the 18th century, Jews were a significant part of the population in Kraśnik, Lubartów and Łęczna. By the 20th century, Jews represented greater than 70% of the population in eleven towns and close to 100% of the population of Laszczów and Izbica. From this region came both religious figures such as Mordechai Josef Leiner of Izbica, Chaim Israel Morgenstern of Puławy, and Motele Rokeach of Biłgoraj, as well as famous secular authors Israel Joshua Singer. Israel's brother, the Nobel prize winner Isaac Bashevis Singer, was not born in Biłgoraj but lived part of his life in the city. 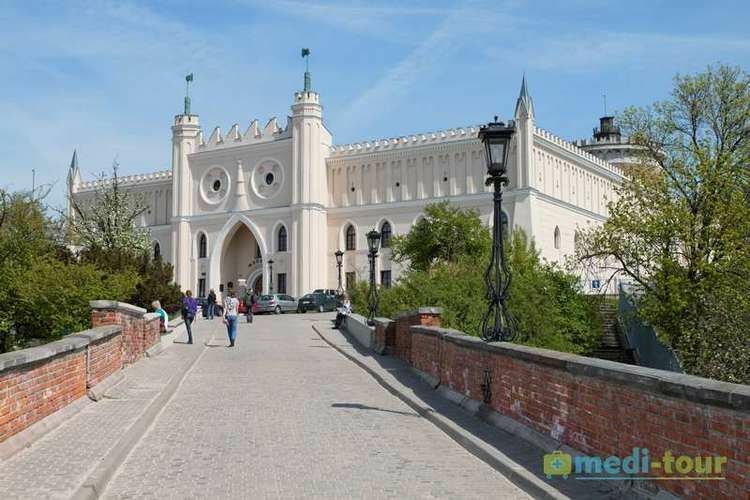 The "Old Town" of the city of Lublin contained a famous yeshiva, Jewish hospital, synagogue, cemetery, and kahal, as well as the Grodzka Gate (known as the Jewish Gate). Before the war, there were 300,000 Jews living in the region, which became the site of the Majdanek and Belzec concentration camps as well as several labour camps (Trawniki, Poniatowa, Budzyn, Puławy, Zamość, Biała Podlaska, and the Lublin work camps Lindenstraße 7 (Lipowa Street), Flugplatz, and Sportplatz) which produced military supplies for the Wehrmacht and Luftwaffe). This was once one of the biggest forced labour centres in occupied Europe, with approximately 45,000 Jewish prisoners. As well, the Sobibór extermination camp was located in the Lublin Voivodeship. After the war, the few surviving Jews largely left the area; today there is some restoration of areas of Jewish historical interest, and a surge of tourism by Jews seeking to view their families' historical roots. 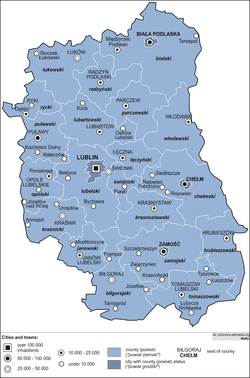 Lublin Voivodeship is divided into 24 counties (powiats): 4 city counties and 20 land counties. These are further divided into 213 gminas. Protected areas in Lublin Voivodeship include two National Parks and 17 Landscape Parks. These are listed below. Lublin Voivodeship (Latin: Palatinatus Lublinensis; Polish: Województwo Lubelskie) was an administrative region of the Kingdom of Poland created in 1474 out of parts of Sandomierz Voivodeship and lasting until the Partitions of Poland in 1795. It was part of the prowincja of Lesser Poland. Lublin Voivodeship was one of the voivodeships of Congress Poland. 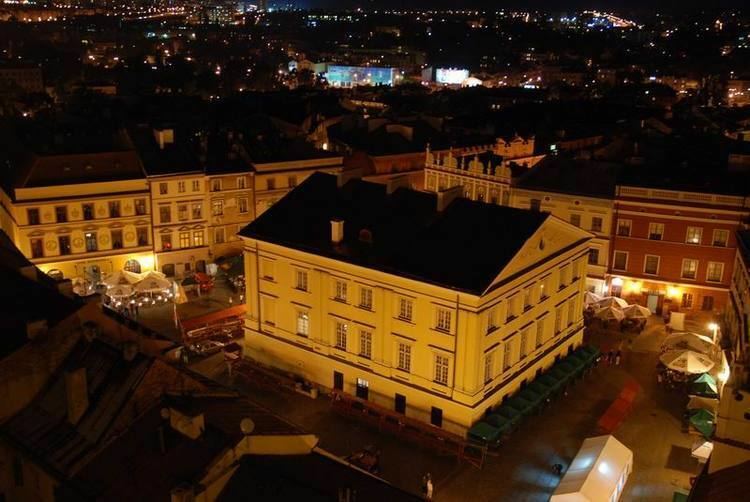 It was formed in 1816 from Lublin Department, and in 1837 was transformed into Lublin Governorate. Lublin Voivodeship (Województwo Lubelskie) was one of the administrative regions of the interwar Second Polish Republic. In early 1939 its area was 26,555 square kilometres (10,253 sq mi) and its population was 2,116,200. According to the 1931 census, 85.1% of its population was Polish, 10.5% Jewish, and 3% Ukrainian. Lublin Voivodeship (województwo lubelskie) was an administrative region of Poland between 1945 and 1975. In 1975 it was transformed into Chełm, Zamość, Biała Podlaska, Tarnobrzeg and Siedlce Voivodeships and a smaller Lublin Voivodeship. Lublin Voivodeship (województwo lubelskie) existed as one of Poland's 49 voivodeships from 1975 until 1998, when it was incorporated into the current (larger) Lublin Voivodeship.